This is a fantastic food find, on par with my last post regarding peanut butter, bananas and Fluff or Marshmallows. Jet Puff Marshmallows have a new flavor out on the store shelves. I found these babies at Target, Caramel Vanilla Swirl. They are FANTASTIC! The marshmallows were fresh and soft tasting, with a butterscotch like flavor, surprisingly good for a packaged mass-marketed confection. As I stated in my previous post, one of my guilty food indulgences is marshmallow. During Christmas 2007 at Williams-Sonoma, we sold commercially produced "gourmet" marshmallows and again at Valentine's Day in 2008. 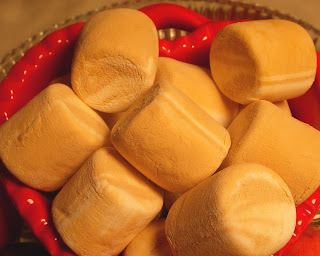 I preferred those to the yearly roll out of the heavy "hand-made" marshmallows that they sell each Christmas; those are like little lead weights and take a lot of tasting to to really enjoy, though they do last a long time in a cup of hot cocoa. Since they company did not sell the puffy marshmallows this past holiday season, I've been on the search for a tender vanilla scented puff of sweet air. These might be it. Jet Puff also makes strawberry, chocolate, a 4-flavor variety, and green and red stars and trees for Christmas. Only the strawberry marshmallows are worth seeking out, the others are unexceptional and even more chemical tasting than anyone should want to taste. If you find these in your local grocery or drug store candy aisle, buy a bunch, they are so worth it! The next grilled peanut butter, banana and marshmallow treat I make will be with the caramel vanilla swirl flavor. Or in a health-ified crispy treat - made with puffed brown rice cereal...nah, who am I kidding a crispy treat should be as decadent as it was meant to be, made with Rice Krispies and good old fashioned butter or margarine! Enjoy! these are fantastic as s'mores!! my husband said these made the best he has ever had. I am so glad to find another person that loves these. I am made fun of by friends since I have become addicted. They are very hard to find out here, though. I am in the suburbs of Chicago. You are right, these are hard to find, but when you do, boy are they great! Seems to me the chocolate ones are easier to boy, and they're okay, but not nearly as good as the caramel.